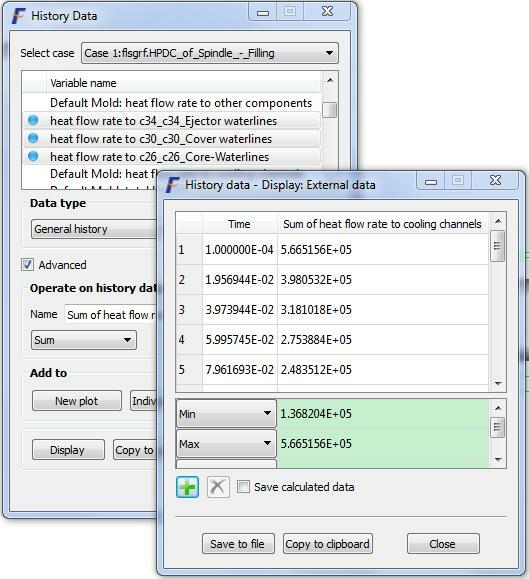 In this third and final blog post about the latest improvements to FlowSight™, I will discuss the key features of the new Preferences Dialog followed by the new calculation options on history data and extra menu options for sampling volumes. Finally, I will give a brief overview of existing and new features to demonstrate the advanced post-processing capabilities of FlowSight. An important part of a CFD study is post-processing the simulations. A strong CFD software can generate high-quality data, but it needs to be coupled with a good post-processor that will let the user easily extract useful and compelling information from that data in an efficient manner. In this section, I will talk about reducing, or eliminating altogether, the repetition of tasks using the Preferences Dialog in FlowSight. 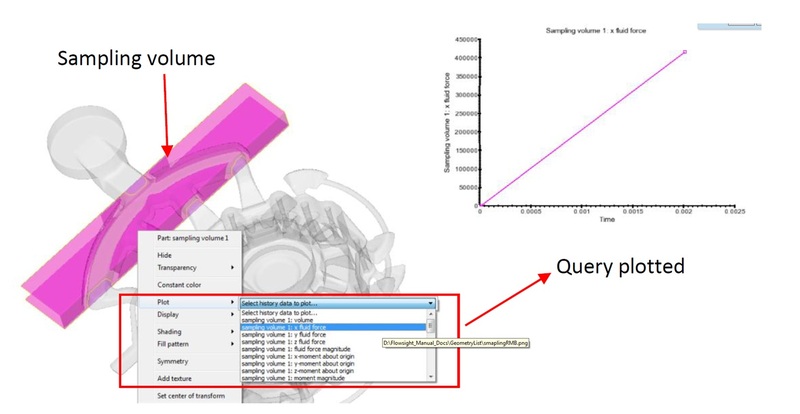 Load Preferences: Includes timeline preferences, geometry preference, and iso-surface preferences. Legend/Color Preferences: Includes legend text font, color and number of levels. Allows setting a preference to a particular variable. Image Saving Preference: Allows images to be saved in the same format (resolution and file type) every time. Viewport Preference: Includes preferences for viewport background color, border visibility, height and width. Other preferences include Views, Mouse Actions and Annotations. An example of a Legend/Color Preferences Dialog is shown below. In addition to visualization capabilities, FlowSight has numerous ways to perform calculations on History data. The History data calculated by the solver includes important time-dependent quantities such as fluid volume, fill fraction and solid fraction. Also included is the output from cooling channels, sampling volumes, history probes, flux surfaces, moving object data, and the pressure and shear force output on the geometry components. Users can perform mathematical calculations on the history data to extract even more information, such as scaling, integration, derivation, summation, multiplication, division, combination, equation specification and fast Fourier transform. An example of the “Sum” query on cooling channels is shown below. In addition to the existing sampling volume options like Transparency, Shading, Fill pattern, etc., users now have two new features – Plot and Display of the history queries associated with the sampling volume. Users can plot fluid forces, moments, volume, etc. and then display them on the FlowSight window as shown in the example below. In the last few posts, we have seen how FlowSight enhances the user experience during the post-processing phase. In addition to its core capabilities of volume rendering, CFD calculators, animated streamlines and pathlines, 2D and 3D slicing, animated time-dependent plots and vortex core generation, these latest improvements have taken FlowSight to another level. 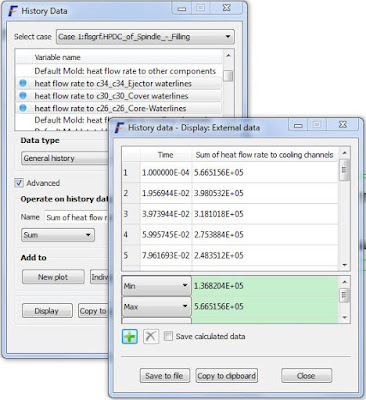 With improvements to the visualization of baffles, sampling volumes, probes, open volumes and iso-surfaces; reducing the computational burden during volume rendering using Stencils; stitching multiple simulations into one seamless simulation; or, simply being able to set preferences to reduce redundancy and speed up workflows; FlowSight continues to provide increased flexibility and ease of use. Readers who are interested in seeing more of FlowSight and its capabilities can go to our website or contact our sales team. And, as a reminder, FlowSight is available in all FLOW-3D products: FLOW-3D, FLOW-3D Cast, and FLOW-3D/MP for no additional cost.